When it comes to isolating the biceps for maximum concentration and development, nothing beats the Body-Solid Preacher Curl Machine GPCB329! Preacher curls are essential for building overall biceps mass including the often difficult lower biceps. 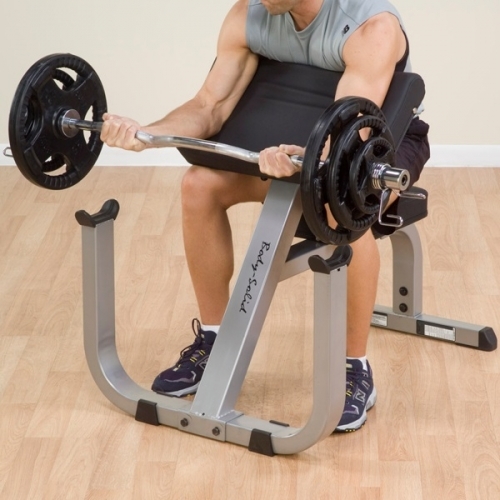 Our preacher curl bench is set to a perfect 30° angle, positioning the upper arm for maximum stretch and full range-of-motion while eliminating stress on your elbows and lower back. The Body-Solid Preacher Curl Machine GPCB329 unique design features intelligent dual function capabilities for the price of one. 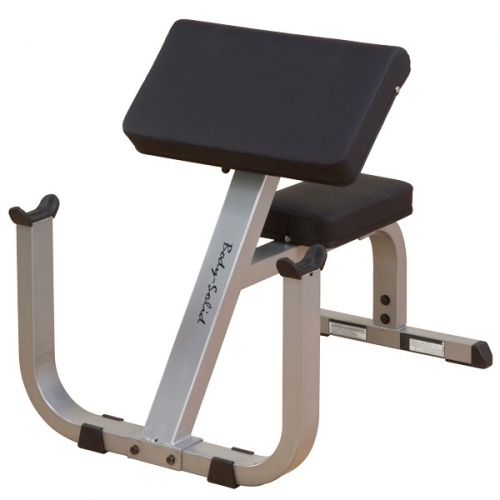 The Body-Solid Preacher Curl Machine GPCB329 features a wide range of adjustability to accommodate all size users. The bicep curl pivots and rotates to accommodate forearm length while reducing wrist stress. Positioned to angle the arm, stabilization pad allows proper joint alignment without elbow pressure on the pad. The Body-Solid Preacher Curl Machine GPCB329 is a uniquely designed piece that is perfect for any home and light commercial application.The Body-Solid Preacher Curl Machine GPCB329 is designed to provide an intense workout while eliminating strain, the Body-Solid Preacher Curl Machine GPCB329 is hard to beat. Easy and convenient step-in design makes getting started a breeze. The Body-Solid Preacher Curl Machine GPCB329 thick, comfortable DuraFirm™ pads reduce fatigue and discomfort allowing you keep working out. Rock solid support and stability is delivered via heavy-gauge steel frames with all-4-side welded construction. Whether gym members are male or female makes no difference, most people are after toned and strong looking arms. Not everyone enjoys or feels comfortable using free weights like dumbbells, kettlebells, or barbells to train the arms, and that’s where state of the art machinery like the Body-Solid Preacher Curl Machine GPCB329 model is the first choice for female and male alike. The convenience of having both exercises in one machine is huge, and most people choose to work their biceps, wrist and forearms together. So it makes sense, and when done safely, the Body-Solid Preacher Curl Machine GPCB329 gets results quickly. The feet should be properly placed for stability, the arms shoulder width apart, and the elbows should touch down on the pad below the shoulder line. Furthermore, the back should be straight not curved, and the eyes directed forward. The Body-Solid Preacher Curl Machine GPCB329was engineered to make all this effortless, and easy on users, whether they’re going light, or really heavy. The lack of machine-like moving parts, and the reliance on natural free weight plates, means it feels more natural and puts increased strain and tension on muscle tissue. The specifics for the Body-Solid Preacher Curl Machine GPCB329is geared towards comfort, reliability, and lifelong usage with minimal to zero calls for maintenance. The Body-Solid Preacher Curl Machine GPCB329 is perfectly suited for both the commercial and home gym environment. It’s not only compact, light weight, and easy to move, but it also comes with a lifetime warranty, which is a pretty big deal and comes rarely. Call 1-800-875-9145 to chat with one of our fitness advisors with any questions you may have about the Body-Solid Preacher Curl Machine GPCB329 . 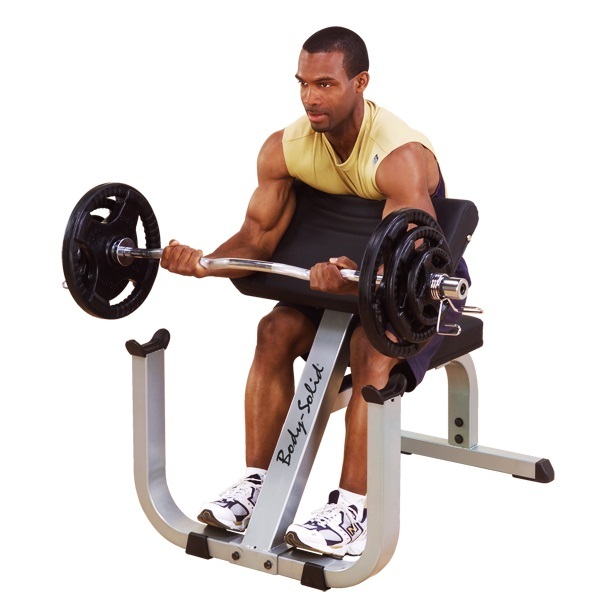 Order your Body-Solid Preacher Curl Machine GPCB329 from FitnessZone today! 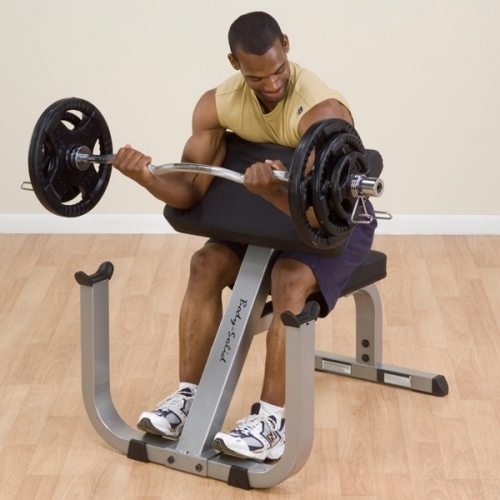 Order your Body-Solid Preacher Curl Machine GPCB329 from FitnessZone.com today!